Emily Wilkinson Wiki: Beautiful, Talented, and Now Engaged to QB Baker Mayfield! 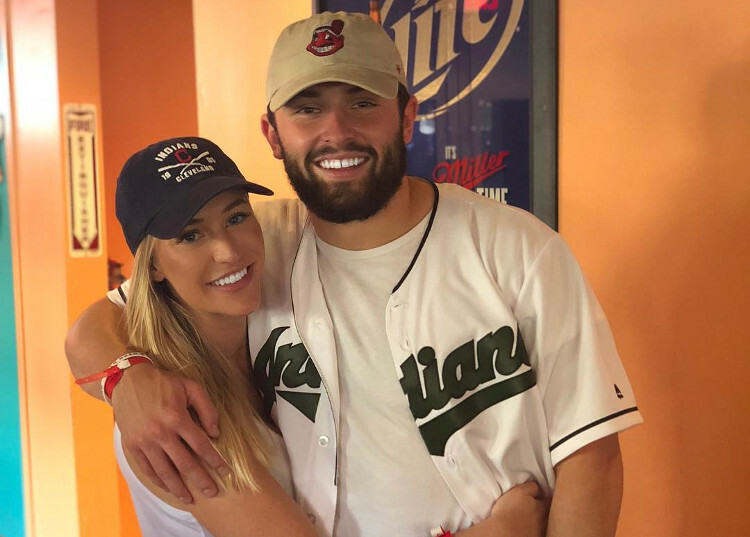 Emily Wilkinson is now NFL star, Baker Mayfield’s fiancee—and she couldn’t be happier! The former patient coordinator at a plastic surgery clinic left L.A. to be with the Cleveland Browns quarterback, and moved to Ohio! Her family and friends are over the moon with the recent engagement. So, while she plans her dream wedding, get to know her a little better with our Emily Wilkinson wiki! Emily Wilkinson is an Instagram model/beauty enthusiast, and her social media feeds are peppered with fashion shoots and styling tips. She has been dating Mayfield since early 2018, and though it might seem like the engagement has come a little too soon—when it’s right, it’s right! Emily Patricia Wilkinson was born on April 4, 1991, making her age 27. She hails from Omaha, Nebraska, but was working and living in L.A., California before her engagement. She quit her job as a patient coordinator at Dr. Galanis’ clinic in April, 2018, to move with her boyfriend Baker Mayfield to Cleveland. It’s unclear whether she’s looking for another job in plastic surgery or is trying her hand at something else, but we’re sure she already has her hands full with wedding plans! According to Linkedin, Emily Wilkinson went to the University of Nebraska-Lincoln, and graduated from the college in 2013. She then took up a job as a bartender at Barry’s Bar and Grill, 10 Below. Back in 2013, she also promoted her workplace on social media, like Instagram. The only way to survive back to back weekends at Coachella and then the Bahamas is with a little help from @tumewater ? Today, Wilkinson endorses many products on her Instagram account, which currently boasts over 130k followers. She suggests style tips and hair care, along with nail salons, clothing brands, and spa’s by promoting their products. Emily Wilkinson’s earnings can be estimated somewhere between $300-$500 per endorsed post on Instagram alone. Her Facebook page suggests that she has also worked with beauty and skincare brand Rodan+Fields. Having worked closely with Dr. Galanis (who she touted as being the “best boss ever”), it’s likely she learned quite a bit about skincare! Wilkinson is born to parents Dave and Lori Wilkinson. And for a while, she was also known as the older sister of social media star Sammy Wilkinson, a singer/songwriter who began his career on Vine back in 2013. Her other siblings are Ben Wilkinson, a fitness junkie and travel enthusiast, and Annie Wilkinson, who runs a podcast. The family of six are pretty close-knit and all their Instagram accounts testify to that! MY BABY SISTER IS ENGAGED!!!! She’s older than me but her and Annie will forever be my baby sisters. So happy for you & @bakermayfield and couldn’t be more excited for what the future holds. Wilkinson will look great on the back of your jersey, kid. The couple was first spotted together at a Clippers game back in January 2018. Since then, fans of the QB have been wondering who the mystery beauty is, and then the Instagram posts cleared all doubts! The couple made their relationship public with utmost grace, and have been seen on Instagram and other social media platforms together ever since. It was a surprise engagement, or so it looks, as the media and the fans were still warming up to the lovebirds. Nonetheless, Emily Wilkinson was presented with an eye-popping diamond ring, as Mayfield got down on one knee and everything! The details of the ring are not available yet, but we’re sure the stunner has cost the QB a pretty penny! With his latest $33.0 million contract with the Cleveland Browns, it’s probably not that big of a pinch. Mayfield was in a relationship with Morgan Mayberry before Emily Wilkinson came into his life, but he let bygones be bygones and has moved on with his “most perfect girl.” Now that he’s put a ring on it, we can only hope to hear of what their wedding plans for the big day will look like!